Holsters have been a recurring topic on our site since the early days. Besides the fact that I am a gear whore, we review so many holsters because there are many niches to fill. With multiple style options and individual unique requirements, you’re never going to find one holster that covers all your needs. This became painfully obvious to me when I evaluated ways to better carry while working out. It was in an effort to fill this gap in my holster armory that I came across the Techna Clip. Techna clip is a belt clip secured to the grip or rear of a gun, providing a no bulk, deep concealment solution. The method of securing the Techna Clip to your firearm will vary based on your firearm. We tested using a Glock 23 and Sig P938, two very different sizes and clip placements. The Glock is installed by replacing the cover plate. The replaced cover plate works as a base to screw the clip into, supporting both left or right handed users. On the Sig P938, the clip is installed under the grips and held in place with the grip screws. Interesting side note on this, my EDC P938 is the SAS model. Unfortunately, due to the shape of the grips the Techna Clip will not work with this model. To their credit this is something they clearly label on their website. Luckily I also have the P938 nightmare and that allowed for the installation of the Techna Clip. Wait What No Trigger Guard? Let’s get this out of the way right now. There is no trigger protection when using the Techna Clip. For some of you this will be the end of the world and likely the last part of the review you read. Are you still here? Good keep reading and I think you will find that the Techna Clip offers several advantages. While we tested the gun using a G23, it had a NY trigger installed making the likely hood of an AD almost impossible. This configuration limited any fear of carrying without a trigger guard. The Sig P938 has a manual safety, even with that though, for the first few days of carrying I went without a round in the chamber and hammer back in an effort to get used to it, as well as make to sure the hammer did not fall during intense movement. For those using striker fired non-safety guns like the Glock, Techna Clips sells two options to make you safer. 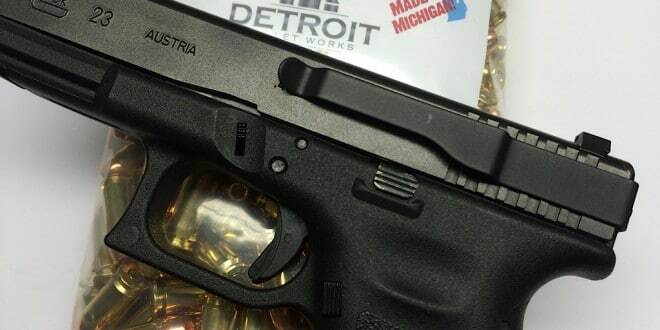 A Conceal Carry Kit consisting of the Clip and a Kydex Trigger Guard. If I didn’t have a NY trigger on the gun we tested, I likely would have bought this configuration. I am writing this article from my home, not the hospital or morgue. So you can surmise that we had no issues with carrying using the Techna Clip. I prefer the way the gun sits when the clip is mounted to the back of the gun instead of in front of the grips, like on the Sig. With the size of the P938 and the placement of the clip, there is not a lot of gun below the waistline, resulting in it moving around and does not feel as secure. While it did not feel secure, it never popped out on us, even during vigorous biking and running. 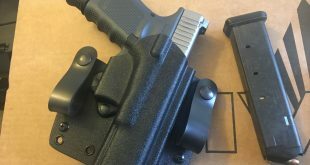 The G23 however has the clip mounted on the rear, allowing for a deep seating into your pants, makes the gun feel much more secure, but is a bit less comfortable. 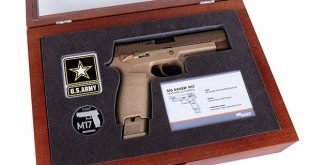 If we had a G26 or 27 to test with it would have likely been the best of both worlds, but unfortunately I sold mine recently. The Techna Clip makes for a very light, easy grab and go solution. When the best gun to use is the one you will carry, I see a holster like this having a place with a few groups of people. Women Shooters make up a huge % of students taking CPL/CCW courses. Unfortunately, the firearms market is still very slow to catch up. Carrying a gun as a woman often means changing your clothing or purchasing a concealed carry purse. The Techna Clip would allow most women to secure a small frame gun in a standard purse. Offering women the chance to not have to choose between style and safety. The clip also is perfect for securing to a skirt that is not supported by a belt. With the Techna clip, a professional woman could easily secure a gun wearing a pants suit without needing to replace her existing wardrobe. This is the reason we first looked at the clip. I wanted an easy way to secure a gun to my sweat pants or shorts; that didn’t have belt loops. I found you would need to tighten the strings on these types of pants to create the retention, and you’re going to need to get used to the feel of the gun in lightweight pants. However, it has worked very well for us, allowing me to carry a gun when working out. I have mentioned before that I need to wear a tuxedo on a fairly regular basis. I had a solution that worked, but was not ideal. The Techna Clip is perfect for situations like this where traditional holsters just won’t cut it. The gun you bring is the best gun to have (have I said this before). The ability to just tuck a gun into your pants without fiddling with a holster, is an advantage. I am used to putting a belt on in the morning with a holster that requires dressing accordingly. It was only when I let that process slide to test the Techna Clip that I realized how convenient it is to carry without a belt fastened holster. When you combine the Techna Clip with the PUG it gets even better. The Pug is the opposite of your clip. It is installed on a hard surface and accepts any belt clip, securing it to that surface quickly. The pug is an ideal way to secure a weapon in your car during travel that then can easily be concealed on your person when you reach your destination. If you keep a spare gun in your console, the Pug and Techna Clip combination makes that spare weapon a concealable weapon on demand. A wise man once said, “Never try to reason with a person who knows they are right.” With that in mind there is no doubt a certain portion of our readers are going to not only dislike this holster, but will actually hate it. That’s fine; we live in a free market society (sort of), and it’s your right to not buy it. No amount of logic, experience or words from me is going to change that. However, while not for everyone, the Techna Clip fills a lot of vacancies in your Edc line up, and should not be just glanced over because of its tiny appearance. If you have the proper gun or need a no bulk easy to grab and go solution this product hits a home run. Be sure to check out their website to see more on the Techna Clip and leave us a message below on how you feel about holster solutions like this one. 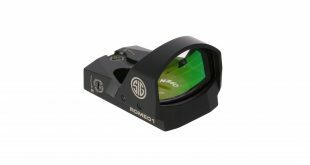 Next The end of the Sig Brace?